Communication within an organization needs to be more and more dynamic. Billboards are being replaced by large monitors where audio visual messages can be distributed either simultaneously across the whole organization or just locally within departments. The corporate content may be managed centrally whereas some local control is required for information at a department level. This type of installation can involve a complex network of several hundreds of display surfaces (monitors, projectors or even video walls) and a few dozens of content sources (media players, TV tuners, computers) distributed within the organization. The installation typically requires a system that is simple to use for the presets configuration phase and the operations phase alike. 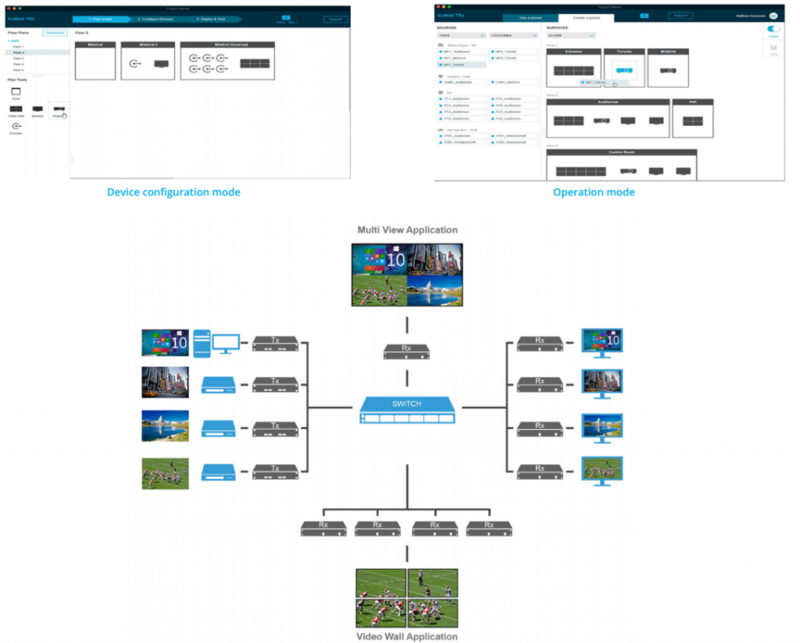 VuWall TRx in combination with the VSIP family of encoders and decoders offers the perfect solution for this type of situation, where the content can be distributed to the displays using the local IT infrastructure. The ease of use of the TRx management software is as such that a marketing operator can easily create preset scenarios, save them and launch them with a simple click of a button. All sources and display devices can be classified by groups based on different criteria. Sending specific content to a specific group of displays is done through a single drag and drop operation.